Duff McKagan Premieres New Song, "Chip Away"
McKagan's upcoming solo album, 'Tenderness,' is set for a May 31 release. Last month, Guns N' Roses bassist Duff McKagan announced a new solo album, Tenderness. Now, McKagan has shared another track from the album, "Chip Away." You can check it out below. 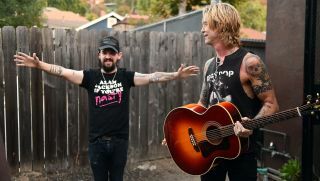 In addition to releasing "Chip Away," McKagan announced that Tenderness will be released May 31. You can preorder the album here. “’Chip Away’ is somewhat of a rail against cable news and divisive agendas, all for the almighty dollar,” McKagan said of the song in a press release. “The song also highlights the fact that history repeats itself over and over, and that we will all get past this, together." Tenderness was produced by Shooter Jennings, and recorded at Station House studios in Echo Park, CA. “We’re becoming divided at a time when we need each other most,” McKagan said. “When huge industries get replaced because of modernization, it’s time to retrain and bolster up those who get swept aside. Homelessness and drug addiction are avoidable in this country if we come together and get private and public cogs turning together in a positive direction. We can at least try to tackle mental illness while we’re at it. But alas, we stump and lie, point fingers and divide. We’re way better than this. You can check out the album art and tracklist for Tenderness below. For more on Duff McKagan and his music, follow along on Facebook.